Tickets: Price 1: GBP 3.00. 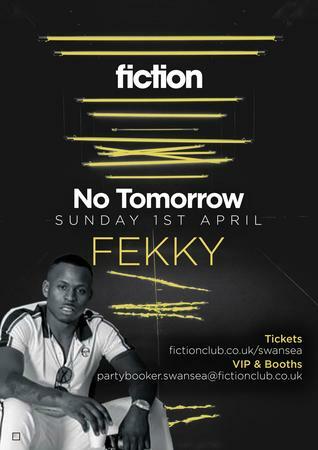 No Tomorrow returns for another sell out Bank Holiday session with special guest Fekky! Delivering rapid, garage-infused hip-hop laced with uncompromising, defiant, and scathing lyrics, Fekky is a grime MC from South London, U.K.
First appearing on the scene in 2011, he got his start laying down a number of ideas with some friends and put out "Ring Ring Trap" with an accompanying online video. The song was a success, drawing in around 10,000 views in a matter of days. The young artist didn't waste time and quickly followed up with "Fire in the Booth," which earned him even more fans. Not one to rest on his laurels, the rapper decided to embark on small-scale nationwide tours, gaining more and more exposure throughout the country. More success followed when he was snapped up by Stateside hip-hop heavyweight the Game to open up for him on his 2014 U.K. tour. 2015 saw. ..